Slipping and sliding around on the snow and ice is part of dealing with winter. If you were injured during a fall caused by poor weather conditions, however, there may be someone to blame other than Old Man Winter.Property owners have a duty to exercise reasonable care when it comes to maintaining the areas of their property that are open to the public. That duty does not end when winter weather arrives. Property owners are required, often explicitly by local law, to promptly remove snow and ice from the public areas of their property in order to reduce the risk of falls and injuries. Property owners can meet their duty by removing the snow and ice themselves or by hiring a contractor, such as a plow company, to do so for them. No matter who does the snow or ice removal, if you are injured because you slipped and fell on poorly maintained property, you may be able to seek compensation from the owner. This does not mean that you are exempt from exercising caution when getting around in bad weather. 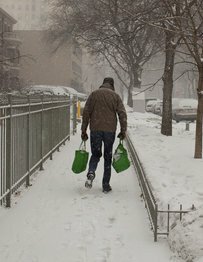 Members of the public also have a duty to use reasonable care when walking in an area known or reasonably expected to be snowy or icy. Failing to do so may reduce your recovery in any potential lawsuit. Slipping and falling is so common, particularly in winter, that some people are embarrassed by their injury or think asking someone else to pay for it would be wrong. However, injuries caused by slipping and falling due to snowy or icy conditions can be quite serious, and the party responsible for your injury should be held accountable. If you have been injured after slipping and falling on snow or ice, an experienced personal injury attorney can help you seek compensation.